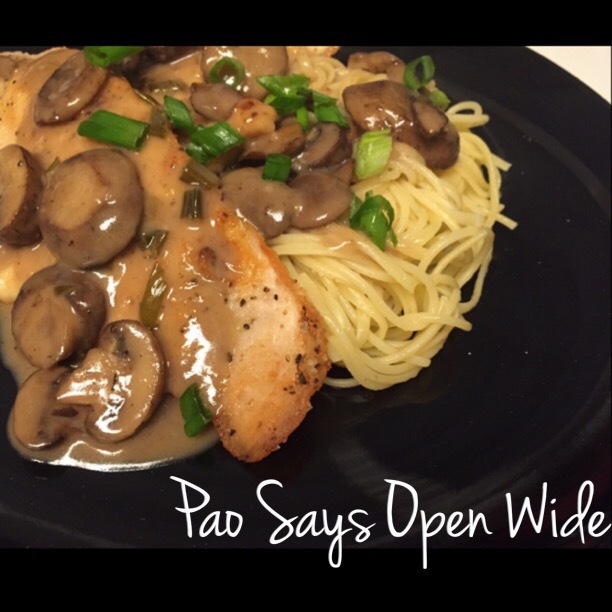 Wine is so Fine: Chicken Marsala – Pao Says, "Open Wide!" Anyways, chicken breasts and mushrooms made me hungry for chicken Marsala. So after clinic, I grabbed a small bottle of Marsala wine and I got to work on my super bomb dinner-to-be. Season the chicken on both sides with salt, pepper, and garlic powder. Coat the chicken with flour. Place chicken in a hot pan coated with olive oil (just enough oil to lightly coat the bottom). Once the chicken is cooked on both sides, set it aside. In the same pan, add a tbsp butter and the mushrooms. Allow them to cook for about 2 minutes, then add the scallions. Add the Marsala wine and the chicken stock. Let this sauce reduce on med-high heat for 5-7 minutes. Add the cream (or milk) to the sauce and stir to incorporate. Serve over the chicken and eat with mashed potatoes or pasta- delicious with either! Pingback: Chicken Marsala #dinner #lunch #RecipeOfTheDay | EPIC Chicken Recipes - All about Chicken recipes and more!